My gosh I love lemon! My mom used to tell the story about when I was little and we went out to eat they would have me in my high chair with a plate full of lemons and I was happy as can be. I still love lemons! 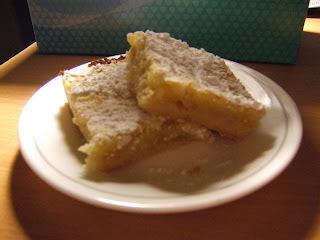 Today I made Lemon Bars and they are sooo good I want to devour the whole pan! I'm not going to though. I'm going to take some to work and munch the rest! heh. Anyway, on to the yumminess! I found this recipe via Bakerella who always has the best darn treats on her site! Be sure to check her out and I guarantee you are going to get a massive sugar craving. * Press mixture into bottom of pan. * Bake for 20 minutes or until golden. * While crust is baking, prepare topping. * In a larger bowl, add sugar, flour, and baking powder. * Then add slightly beaten eggs and lemon juice. * Mix well and pour on top of warm baked crust. * When cool, dust with confectioner's sugar and refrigerate. Hmm. About me. I love to cook. A few years ago I couldnt even make spaghetti (think spaghetti logs) and I am slowly but surely learning how to cook and bake.